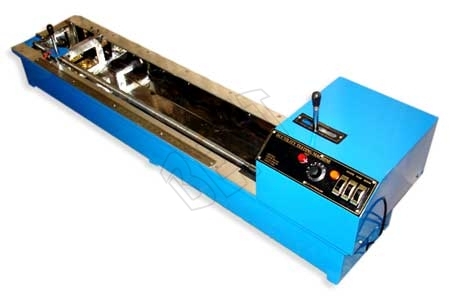 The Ductility Testing Machine, offered by us is important bitumen testing equipment that is an electrically operated machine, which is designed to test three specimens simultaneously. We manufacture Ductility Testing Machines using excellent raw materials to ensure good functionality and durability. Ductility Testing Machine is used for determining ductility of shaped asphalt/cement or semi-solid bitumen. The machine consists of a moving carriage that moves over a lead screw. An electric motor driven reduction gear ascertains trouble-free and constant speed enabling continuous operation. The whole assembly is mounted by a stainless steel water bath completely enclosed in a metal housing having glass wool insulation. It is equipped with an electric pump circulator and a heater. Herein, the temperature is controlled thermostatically. The machine is fitted with three ductility molds and has two rates of travel; 10 mm & 50 mm.